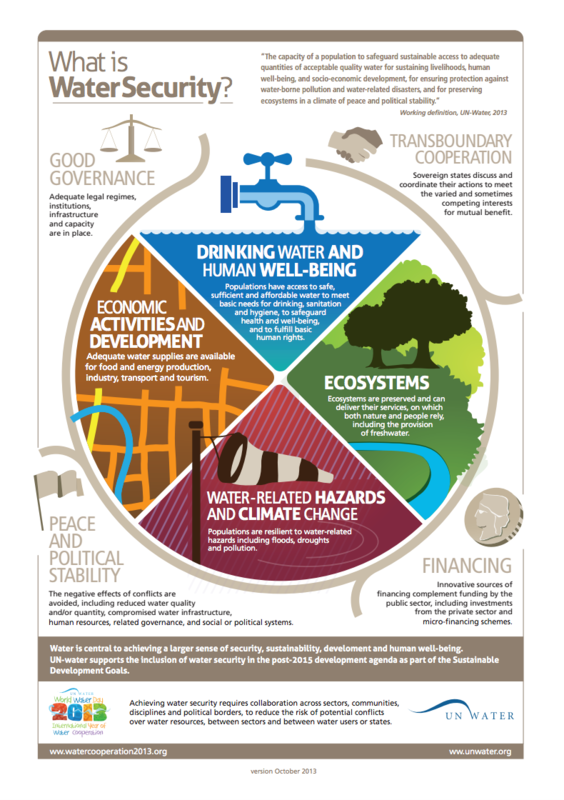 “The capacity of a population to safeguard sustainable access to adequate quantities of acceptable quality water for sustaining livelihoods, human well-being, and socio-economic development, for ensuring protection against water-borne pollution and water-related disasters, and for preserving ecosystems in a climate of peace and political stability.” This is the definition proposed by UN-Water to serve as a starting point for dialogue in the UN system. Discover on this infographic the key elements of water security, and the centrality of water to achieving a larger sense of security, sustainability, development and human well-being. UN-Water hence supports the inclusion of water security on the agenda of the UN Security Council and in the post-2015 development agenda as part of the Sustainable Development Goals.